The Neutron star Interior Composition Explorer (NICER): Design and Development: Gendreau, K.C., Arzoumanian, Z. et al. 2016, Proc. SPIE 9905, Space Telescopes and Instrumentation 2016: Ultraviolet to Gamma Ray, 99051H (22 July 2016). The NICER Instrument Detector Subsystem: Description and Performance: Prigozhin, G., et al. 2016, Proc. SPIE 9905, Space Telescopes and Instrumentation 2016: Ultraviolet to Gamma Ray, 99051H (22 July 2016). The Performance of NICER flight x-ray concentrator: Okajima, T., et al. Proc. SPIE 9905, Space Telescopes and Instrumentation 2016: Ultraviolet to Gamma Ray, 99051H (22 July 2016). The Neutron star Interior Composition Explorer (NICER): Mission Definition: Arzoumanian, Z. et al. 2014, Proc. SPIE 9144, Space Telescopes and Instrumentation 2014: Ultraviolet to Gamma Ray, 914420 (29 July 2014). 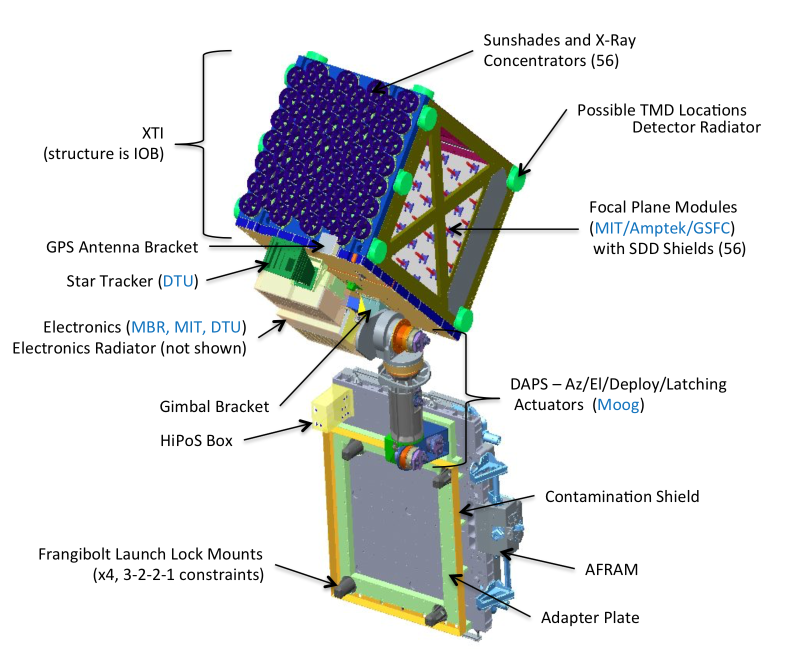 The Neutron star Interior Composition Explorer (NICER) is an International Space Station (ISS) payload devoted to time-resolved spectrometry in the 0.2-12 keV X-ray band. NICER was launched aboard a SpaceX Falcon 9 rocket on June 3, 2017 at 17:07 EDT (21:07 UTC), and deployed at the ISS on June 16, 2017. These instrument properties make NICER ideal not only for the study of X-ray pulsars, but for the study of a wide variety of cosmic X-ray sources (accreting compact binaries, flaring sources, stars, supernova remnants, galaxy clusters, etc.). NICER's X-ray Timing Instrument (XTI) is an aligned collection of 56 X-ray "concentrator" optics (XRC) and silicon drift detector (SDD) pairs. Each XRC collects X-rays over a large geometric area from a roughly 30 arcmin2 region of the sky and focuses them onto a small SDD. The SDD detects individual photons, recording their energies with good (few percent) spectral resolution and their detection times to 100 nanoseconds RMS relative to Universal Time. Together, this assemblage provides a high signal-to-noise-ratio photon-counting capability within the 0.2 – 12 keV X-ray band, well matched to the typical spectra of neutron stars as well as a broad collection of other astrophysical sources. From NICER's ISS platform, a star-tracker-based pointing system allows the XTI to point to and track celestial targets over nearly a full hemisphere. NICER uses a co-aligned array of 56 X-ray concentrators (XRC) which are designed to concentrate (as opposed to focus) X-ray light from cosmic sources onto a restricted area of the X-ray detectors. Each of the X-ray Concentrators (XRCs) consists of 24 nested parabolic gold-coated thin foil mirrors. After bouncing off the XRC mirros, the X-rays are concentrated onto the 2mm aperture of a Focal Plane Module at the instrument backplane. The XRCs were calibrated on the ground at an X-ray beamline at the Goddard Space Flight Center. The absolute alignment of all the XRCs is better than 57 arcseconds, with most XRC alignments being much better than that. Data from individual FPMs can be examined and analyzed. Most commonly, data from all 7 MPUs are combined into a merged list of science events for analysis. Figure 2: The layout of the Focal Plane Modules on the NICER XTI backplane. Measurement and Power Units (MPU) for readout. The XTI is actively pointed by NICER's pointing system. This includes a star tracker that provides 2 arcsecond-resolution quaternions at 8 Hz, pointing control software in the Main Electronic Box (MEB), Gimbal Control Electronics (GCE), and modified Type 5 Moog actuators in an elevation over azimuth 'wrist' configuration. This wrist is connected to a boom that is deployed to give NICER a clear view of the sky. The MEB also hosts a GPS receiver to provide an accurate time standard. NICER can view targets within its allowed sun angle (SA) range of 45° < SA < 180°. However, there may be obstruction of targets within the allowed sun angle zone by ISS structures near NICER (in particular the ISS solar arrays). Figure 3 below shows a fish-eye rendering of NICER's field of regard on ISS at Express Logistics Carrier 2 (ELC2) Site 7, generated by the MAGIK Robotic Analysis Team, where the panoramic fisheye eyepoint was placed at NICER's deployed location. Figure 3: A fish-eye view of NICER's field of regard on the ISS. Other factors, such as the effect of bright earth on low-energy NICER background, may play a role in scheduling observations. Generally NICER can obtain useful data for targets beyond 40 degrees from bright earth; however this limit may be increased for X-ray sources if emission at energies below about 0.5 keV is important. Assessment of target visibility requires frequently updated models for the ISS ephemeris, attitude, and various joint angles (e.g., ISS solar panels and radiators). Plans are optimized to avoid the Sun (> 45°), Moon (> 15°), Earth (> 30°), ISS infrastructure (> 15°), glint from Sun-illuminated ISS infrastructure as well as a "keyhole" around the pointing system's azimuth axis. In addition, observations generally avoid passages through the South Atlantic Anomaly (SAA) and high geomagnetic-latitude radiation zones (the "polar horns"). Radiation background due to the SAA and polar-horn regions reduces the typical overall good time on targets to about 65% of the time. Pointing schedules typically involve tracking 3 to 6 targets during each ISS orbit. A target is observed typically until it encounters one of the conditions described above, then NICER slews to a new target, and so on. NICER tracks targets 80–90% of the time, with the balance mostly in slews between targets. A small fraction (<5%) of the time is spent idle, waiting for targets to become available. NICER generally does not need to stow during ISS docking events or most Extravehicular Activities (EVAs). NICER has demonstrated it can maintain pointing during the most extreme Soyuz vehicle docking events. However, when EVAs and some robotic activities occur near NICER's home at ELC2, NICER must stow and power down per ISS safety rules. In 2017–2018, NICER only had 2 occasions where this ISS rule was invoked, resulting in a loss of about 62 hours of observing time (only 0.7% of NICER's total time on orbit). NICER is controlled from the Science and Mission Operations Center (SMOC) at GSFC. NICER is connected to the SMOC via the extensive ISS communication infrastructure. Approximately 80% of the time, the SMOC has real-time access to NICER for data acquisition and commanding. In practice, however, the SMOC is only staffed for a nominal 8 hours per day, 5 days per week. The basic flow of operations in the NICER SMOC is shown below. Commanding can only be done, at this point, when a NICER operator is in active communication with the Huntsville Operations Support Center (HOSC). 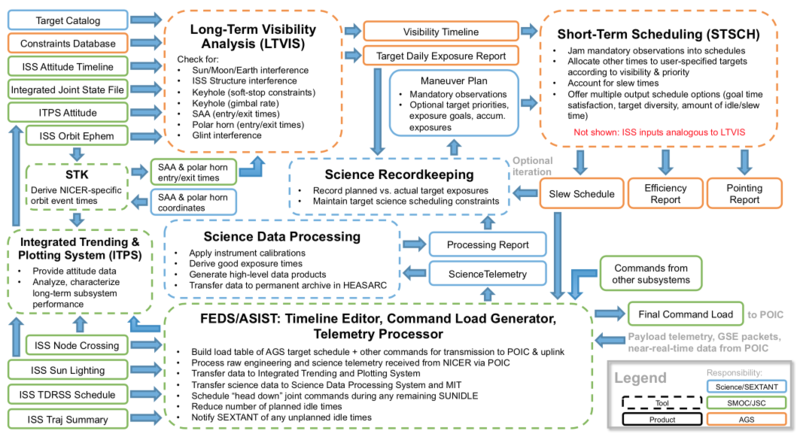 Typically, a target command list is generated twice a week with a plan to observe dozens of objects. When Targets of Opportunity (TOOs) become available, plans can be rapidly updated and uploaded to the instrument. A typical response time for a TOO during staffed periods is < 4 hours. Figure 4: Flow of Information and Activities in the NICER SMOC. NICER is also used to demonstrate the feasibility of pulsar-based spacecraft navigation. This portion of the NICER mission is referred to as the Station Explorer for X-ray Timing and Navigation Technology (SEXTANT). SEXTANT uses observations of X-ray pulsars to determine absolute position in space, a technology that may be critical for deep-space exploration. The SEXTANT observations of X-ray pulsars are also useful for scientific study. The SEXTANT team developed flight software that looks for data from a selection of known high-timing-precision millisecond pulsars (MSPs). This software runs in parallel with other NICER MEB functions without adverse impact to computer performance. When NICER happens to be looking at a SEXTANT pulsar, an Extended Kalman Filter works to determine the time of arrival (TOA) of the pulsar pulse by evaluating the timestamps of individual X-ray photons and comparing to a pulse template. The TOA is used to update an orbit propagation model. For one week in mid-November 2017, the SEXTANT team took over target planning to ensure a good spatial mix of MSPs that could be used to stitch together a three-dimensional estimate of NICER's location. The SEXTANT software autonomously determined the location of the instrument to within approximately 5 km for a two-day period. After deployment on June 15, 2017, NICER began to check its major subsystems. A raster scan by NICER of the region around the bright X-ray point source Serpens X-1 and the Crab Nebula showed that the relative alignment of the pointing system to the XTI could be determined to 11 arcseconds. The NICER on-orbit effective area has been calibrated using standard targets like the Crab, the supernova remnant 1E 0102.2–7219, 3C273 and others. Timing resolution was assessed using NICER observations of one of the fastest known MSPs, PSR B1937+21; these observations verified performance using the sharp ~29 microsecond-wide pulse in this 1.56-msec period pulsar. XTI energy gain calibration and spectral resolution were evaluated on the ground in laboratory and synchrotron-facility measurements, as well as in comprehensive thermal-vacuum tests using a combination of electronic and radioactive X-ray sources, and through study of line-rich sources of thermal radiation on orbit. 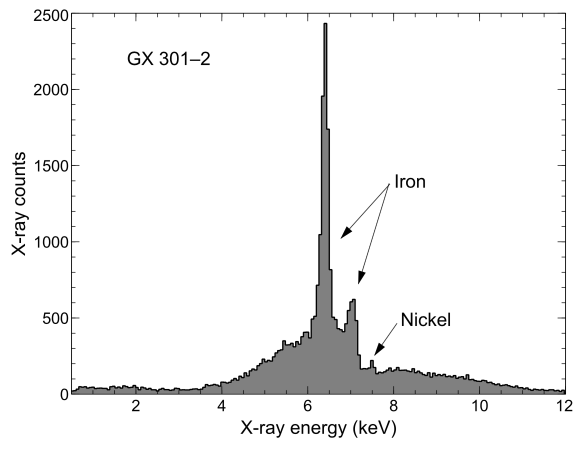 As an example, Figure 5 shows an early NICER spectrum of GX 301–2 using data combined from the 52 operating FPMs. and gain near the Fe K-shell energy band. NICER detects X-ray and other events which get telemetered to ground. Each event is characterized by its time stamp, its pulse height amplitude (in one or two timing chains, see below), and the FPM in which the event was detected. An event may be an X-ray photon from the sky, energy deposition from a particle, or a signal originating in the detector electronics. NICER events are cleaned and calibrated by the NICER processing pipeline. Below we provide an overview of how this is done and discuss some important information for the reduction and analysis of NICER science data. NICER events consist of X-ray photons and charged particles (and secondary gamma rays produced by the interaction of charged particles with the instrument). Detected events are converted to an amplified charge signal, or pulse, which is divided into two analog signal processing chains. These two chains have different pulse-shaping time constants: the "slow" chain has a peaking time constant of 465 ns, while the "fast" chain has a peaking time constant of 85 ns. The slow chain is optimized for measuring the energy of the event, while the fast chain is optimized for timing. Signals that pass a discriminator threshold produce an electronic trigger which causes on-board software to sample the triggered pulse height and provide a time stamp. For events where both chains trigger, the fast chain timestamp is reported; otherwise, the slow chain timestamp is reported. Chain triggering depends on the event pulse height, which is proportional to the energy of the event. Photons or particles with energy E ≲ 1 keV do not trigger the fast chain; higher energy events will trigger both chains. The fast chain timing uncertainty is 70 ns. The slow minus fast timing uncertainty is < 4 ns, so that the two analog chains have nearly identical timing uncertainties. Time biases are typically ~250 ns for the fast chain and ~760 ns for the slow chain for individual NICER detectors, and timing variations between individual detectors are typically ~11 ns. The measured biases are corrected using NICER standard software (nicertimecal). The NICER calibrated event timestamp values after this calibration is performed refer to the time that an on-axis X-ray or particle entered the detector aperture. Both particles and local (non-cosmic) high-energy radiation can generate events detected by the FPMs. In general, analysis of X-ray emission from the target of interest needs to account for these backgrounds before analysis can proceed. Some non-cosmic background is removed by the standard processing pipeline, but residual background events may remain in the cleaned data. The user should examine the cleaned data, and, if necessary, perform additional data screening. Particle background is particularly severe during times when the ISS is near the South Atlantic Anomaly. Particle-induced events typically have very high amplitudes and/or occur far from the center of the detector. Many of these events can be filtered out of the event list to produce a cleaned list of predominantly X-ray only events using the detected amplitude and/or offset from the detector center (Gendreau et al. 2016). The ratio of pulse amplitudes for events detected in both the slow and fast chain, PI_RATIO = PI_SLOW/PI_FAST is related to the event offset from the center of the detector. 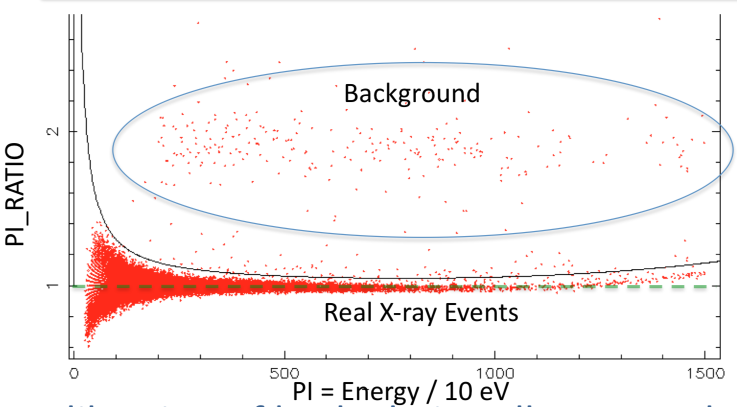 Events with PI_RATIO > 1.1 + 120/PI are likely particle events and are normally excluded from standard X-ray analysis. 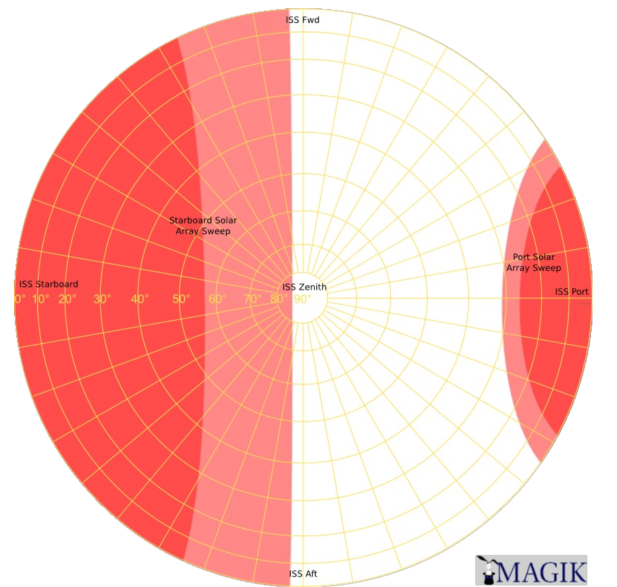 There are a number of sources of local electromagnetic background radiation that can affect NICER X-ray data. Sunlight produces detected noise events for low sun angles, or for low bright earth angles. In addition, sunlight reflecting off of the ISS solar panels or other ISS structures can be reflected into some subset of NICER FPMs. Solar radiation, whether direct or reflected, usually affects the low energy (E << 1 keV) portion of the spectrum. All detectors produce a noise peak at very low (E < 0.3 keV) energies. This noise peak exhibits a gaussian-like energy distribution with a variable amplitude. When the amplitude is large, the tail of the gaussian distribution may leak into higher energies, up to about 0.4 – 0.5 keV. This is common in certain, especially light-sensitive detectors, notably FPM 34. The NICER team has now clearly identified the difference between PI and PI_FAST as a discriminator of background events, because background events (charged particles and gamma rays) that interact in outer regions of the detectors create different charge clouds than concentrated X-rays. This results in different pulse heights in slow and fast chains. A valid X-ray event which is detected in both the slow and fast chains should have similar pulse heights in both chains. The figure below shows the PI_RATIO, defined as PI_RATIO = PI/PI_FAST vs PI. The region in this diagram marked by the blue oval shows events which are background events. Figure 6: A plot of PI_RATIO vs PI for an event file. Background events are separated from valid X-ray events. Good Time Intervals are defined using the NICER nimaketime task. Properties of each detected NICER event are recorded as a binary table in FITS-formatted files which follow the HEASARC conventions for event lists. There are three types of NICER event files which are distributed, based on how useful the data are for science analysis. TSTART and TSTOP: these record the start of the first good time interval and the end of the last good time interval, respectively, in TT seconds from the epoch specified above. EXPOSURE: records the total livetime for the observation. The header keyword called LEAPINIT gives the number of leap seconds (2) since the NICER epoch. The value of this header keyword is meant to be used by downstream software when performing time conversions. However, for some data, this keyword value was set to 0 in the header. This keyword should have a value LEAPINIT = 2. Users should confirm that this is the case, and if not, this keyword value should be corrected manually. The Unfiltered File contains raw event data from the XTI. These uncalibrated events are contaminated with background events and therefore of little use for subsequent science analysis. 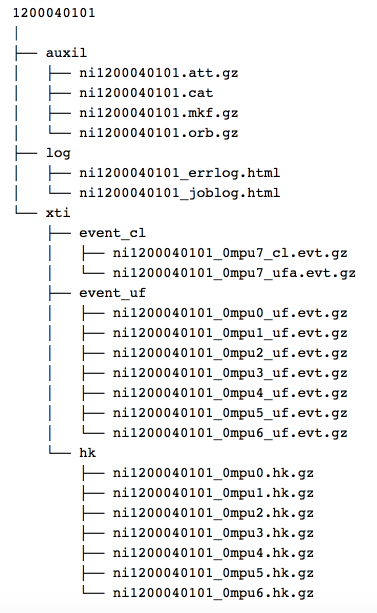 These files are stored in the xti/event_uf subdirectory using the standard NICER data directory structure. There is one uf file for each MPU chain. Pulse heights in the UF files are stored in the PHA and PHA_FAST columns in the EVENTS extension. Note that each MPU and each FPM has a different pulse height scale. Thus the uncalibrated pulse height values in the unfiltered files are of no real scientific value. This UFA file contains unfiltered, merged, energy calibrated events. Calibrated, unfiltered files are named with the following convention: ni<obsid>_0mpuN_ufa.evt, where <obsid> is the 10-digit OBSID and N is in the range 0 ≤ N ≤ 6 to denote one of the seven individual MPUs; a value of N=7 indicates that data from all the MPUs and FPMs have been merged into a single list. This file is generated from the unfiltered (UF) file by nicercal, which adds the PI and PI_FAST columns as well as applying the clock corrections. All MPUs merged into a single file. Pulse heights have been calibrated and stored in the PI and PI_FAST columns of the EVENTS extension. The PI values are binned into linear channels which are 10 eV wide, ranging linearly from 0 to 15.01 keV. This file should not typically be used for science analysis but it does contain particle and other background event information which is helpful for determining instrument deadtime and times of high background. These files are stored in the xti/event_cl subdirectory using the standard NICER data directory structure. There is one ufa file for each MPU chain, along with a merged file in which ufa data from all the FPMs are combined into a single file. The Cleaned Events (CL) file contains the cleaned and calibrated science events. Calibrated, cleaned event files are named with the following convention: ni<obsid>_0mpuN_cl.evt, where <obsid> is the 10-digit OBSID and N is in the range 0 ≤ N ≤ 6 to denote one of the seven individual MPUs; a value of N=7 indicates that data from all the MPUs and FPMs have been merged into a single list. trumpetfilt = YES "Trumpet" filtering cut based on PI_RATIO is applied. Expression is: "PI_RATIO < fastconst + (fastsig/10 eV)/PI + fastquart×PI3"
filtexpr = EVENT_FLAGS=bx1x000 Remove all UNDERSHOOT, OVERSHOOT, and FORCED TRIGGER events. Also remove all FAST-ONLY events, so all events will have triggered the slow chain. Note that the NICER response below about 250 eV can be complicated; the standard screening removes events below 200 eV. bit 1 (xxxxxx1x == 2): "overshoot"
Valid X-ray events have bit 4 set (=1) and bits 0, 1, 2 = 0 (bit 5,6,7 can be either 0 or 1). Events triggering both the Fast and Slow chains have bit 3 & 4 = 1, and bits 0, 1, 2 = 0 (bit 5, 6, 7 can be either 0 or 1). NICER data from the X-ray Timing Instrument (XTI) consist of event files for each of the 56 individual NICER detectors. Groups of 8 detectors are controlled by individual measurement/power units (MPUs), so that there are 7 MPUs numbered 0-6. A NICER observation thus includes a set of event files for each of the 7 MPUs. For each observation, these unfiltered event files for MPU 0 through MPU 6 are stored within the $OBSID/xti/event_uf directory (where $OBSID is the 10 digit NICER observation identifier). Data reduction using the standard NICERDAS software generally assumes that NICER data retain this directory structure. NICERDAS is a set of NICER-specific tools distributed with HEASoft version 6.24 or later. NICERDAS uses the HEASARC CALDB to access calibration data. For a description of the NICER CALDB files and structure, and details of the analysis of NICER data, please see the NICER Analysis Guide.